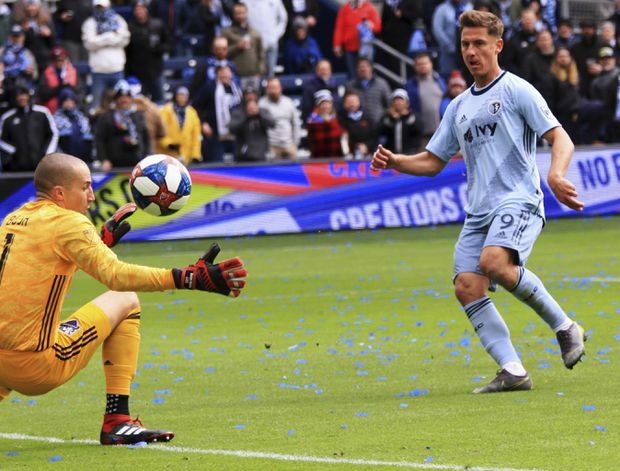 Sporting Kansas City forward Krisztian Nemeth chips the ball over Montreal Impact goalkeeper Evan Bush for his third goal of the match on Saturday, March 30, 2019. Montreal (2-2-0) was trying for its third road win of the season, which would have matched its 2018 total. But the Impact fell well short as its season-opening, six-game road swing continued. Sporting KC (2-1-1), which has won two of its last three, won a game in the series for the first time since July 18, 2015. Montreal’s Saphir Taider cut the deficit to 7-1 in the 89th minute. The Impact return to action next Saturday against New York City FC.